Welcome to the first day of NaBloPoMo 2011 here at Oh Waily Waily. Happy All Saints Day, Samhain, Day of the Innocents and World Vegan Day. Congratulations to Kerala, Karnataka and Haryana on their Foundation days, and to Antigua and Barbuda on this, their day of independence from the UK. And a big hi to Algeria on their national day too. I hope everyone celebrating is having a good day. 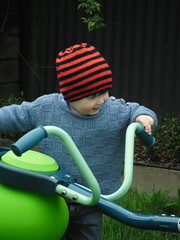 While I am feeling in a celebratory mood I thought I would share some photos of joy in action. Who does joy better than anyone else? Children. Here are some photographs of Miss and Master Oh Waily taken a few weeks after their 4th and 2nd birthdays. They are enjoying their joint birthday present from Nana and Poppa Oh Waily. Can you tell that they love it? Don’t you just wish you could feel like that each and every day? For those wondering, it is both a see-saw and a roundabout all in one. 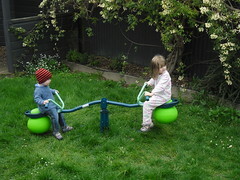 There may be two years between the Oh Waily children but there is barely two kilos in weight difference, so it works reasonably well with Miss Oh Waily in charge of the bouncing and the spinning. Every time I look at these photographs of my children, or other people’s for that matter, it is hard not to be taken with the way they find joy in very simple things. Jaded adults look upon them and think that is very much the way of children. Not world weary, not worn down by cares and responsibilities, still able to connect nearly each and every activity to pleasure*. In my weak, stressed and busy moments it makes me long to be a child once again. Responsibility, shmonsibility. Let someone else make the decisions, buy the groceries, decide what’s for dinner, who to employ and what to do next in the business. Let me be oblivious to all those other things going on that take the gloss off my days. Let me just run around crazy with all the energy of the sun bursting out of me. What a fantastic, and fantasy, world that would be. But life isn’t designed that way. Age and responsibility go hand in hand, for most people. Now I get to see that joy in my children. I want them to enjoy that for as long as possible. Childhood is a tiny percentage of a person’s entire life, why rush them on through it. Let them enjoy that environment, I say. You may be wondering where this talk of joy and daily celebration is meandering to. It is taking us on a walk to one of the bigger, adult, decisions I will have to make on behalf of my children. Schooling. I am very much leaning towards the decision to home school both of the Oh Waily kids. For those who are new to Oh Waily, this has been an ongoing internal debate for me over the past six months or so. I have, rightly or wrongly, always held something of a skewed view of home schooling. I was brought up in the traditional school system, with exams being king. I was good at exams. It suited me and I was clever enough to learn the tricks to doing well. My curiosity still abounds despite this, and I love continuously learning new things. But. I feel like this style of learning has left me with something of a handicap. External or extrinsic motivation. I don’t really want that for my children. I would much prefer them to be internally motivated. I think it would serve them better throughout their lives. One of the main problems I have with “home schooling” is that I associate it, in the back of my mind, with people living alternative lifestyles or those with strong religious views. I am neither of those stereotypes. I am in fact the stereotypical middle of the road person. I do not hold views (generally speaking) that would have me hanging off the political or economic spectrum at either end. I am not religious, but have my own set of ethics and morals that I would prefer my children to lean towards. I certainly don’t have any background indicating that unschooling would be my eventual choice of learning style for my children, but it seems that appearances are deceptive. I can see how the joy of learning would be kept alive by such means, and how depth of knowledge would come from being able to pursue your actual interests rather than a set curriculum. The other thing that has been holding me back from full commitment is the hang-over fear of stuffing it up. Consciously I know that if things don’t work out as I hope, it is only a matter of enrolling the kids in school, but part of me is still intimidated by the idea of the scale of the work involved. This is a big choice. It is a big commitment. In essence I know it will be a lifestyle choice through the fact that it is different from the norm. My life will not resemble those of most of the mums I know. But part of me is excited about the idea that I will be responsible for my children learning about the world. 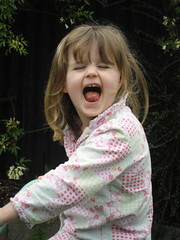 Part of me wants to allow my children to keep that innocent joy captured in the photographs for as long as possible. The routines of school, I think, would not accommodate that. Playtime and lunchtime simply blips in a day spent, largely, indoors. No, I think it is time to make a full commitment to this idea. I have read so many books now and the only real things holding me back are fear of the unknown and, to a very much lesser extent, fear of the reaction such a choice provokes in others. I am, to a greater or lesser degree about to be viewed as alternative. That is not really important in the scheme of things, but it does jar a little. Decision made. Joyful play and learning will be the goal. * I’m fairly certain that immunisation visits are not connected with pleasure for most kids. What a great opening (kindof) post for NaBloPoMo. Looking at Cass now, the “they are only children for a short time” really hits home. 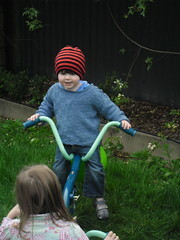 Your young man is pretty much half way through his childhood now (depending on how you view childhood, of course). Gretchen Rubin is right – “the days are long, but the years are short”. Sometimes I find myself missing that as I am nose-down in daily “work” – home or external. I think it’s a good motto to live by – I’m tempted to print it out and put it up where I can see it every day as a reminder to enjoy each day with the kids, family & friends. But, this time with Cass as he is now, he feels more like a contemporary with such similar tastes and likes to me. So it’s a different sort of appreciation. But I have to agree discipline, stamina and patience are the areas that have been the most troublesome to me with coming to the decision. But it will be some kind of journey – that’s for certain. Lots of people I know seem to be considering home schooling at the moment. I’ve been in awe of your Montessori programme for some time now. You’ll be great at it. Thanks for the kind words Sol. But really I’m a rank amateur when you start to look around the home ed / Montessori blogosphere.